I was making chicken Parmesan last week for dinner one night (for which I will be posting the recipe tomorrow) and wanted to make some bread to go alongside of the meal but I wasn’t sure what I really felt like. I didn’t want something that was too labor intensive since I have been pretty busy with work and the holidays and with Michelle traveling a lot recently, so I decided on this recipe I found on Williams-Sonoma for a basic onion focaccia. 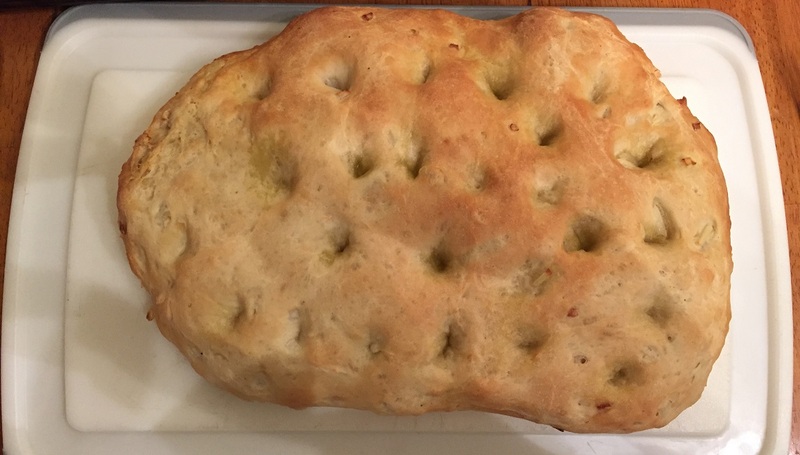 I have made focaccia from them before and the recipe turned out pretty well and this one seemed just as easy so i thought I would give it a try to see how everything came out. In the bowl of a heavy-duty stand mixer fitted with a paddle attachment, dissolve the yeast and a pinch of sugar in 1/2 cup of the warm water. Let this stand at room temperature until the mixture is foamy, about 10 minutes. Add the remaining water and sugar, 1/4 cup of the olive oil, the table salt and 1 cup of the bread flour. Beat the mixture at medium speed until it is creamy, about 1 minute. Add 1 cup of the bread flour and beat on medium-low speed for 2 minutes. Stir in the onion and switch the mixture attachment to a dough hook. On low-speed, beat in the remaining bread flour, 1/2 cup at a time, until a soft dough forms and starts to pull away from the bowl. Knead the dough on low, adding flour 1 tablespoon at a time if the dough sticks, until it is moist, soft and slightly sticky, about 6 minutes. Cover the bowl loosely with plastic wrap and allow it to stand for 20 minutes. Line a heavy rimmed baking sheet with parchment paper and brush the parchment paper with olive oil. Turn the dough out onto the prepared sheet and with oiled fingers press and flatten the dough into an oval about 1 inch thick. Cover the dough loosely with oiled plastic wrap and allow it to rise at room temperature until it has doubled in bulk, about 1 hour. With your fingertips, make deep indentations, about 1 inch apart, all over the surface of the dough. Drizzle the remaining olive oil over the dough. Cover the dough again loosely with plastic wrap and let it rise again at room temperature for about 30 minutes. Place a baking stone on the lowest oven rack and preheat the oven to 425 degrees. Sprinkle the bread lightly with coarse salt. Place the pan on the stone and bake until the bottom of the bread is lightly browned, about 20 to 25 minutes. Serve the bread warm or at room temperature. The focaccia went perfectly with the chicken and even though it does not seem like a lot of onion in the recipe the onion flavor really comes through in the bread. The dough rises quite a bit so I had a very large focaccia and ended up freezing some so we could have it at a later date. You could easily sprinkle a little cheese on top before you bake it if you wanted to go that route, but I think it turns out perfectly just the way it is and it makes an excellent addition to all kinds of Italian dishes.